This book is a welcome addition for those interested in anti-aging/life extension. Dr. Kyriazis explains complicated scientific concepts in terms that are readily understood by the average reader, yet he avoids 'talking down' to the professional. This book focuses on some of the most important anti-aging substances currently available. 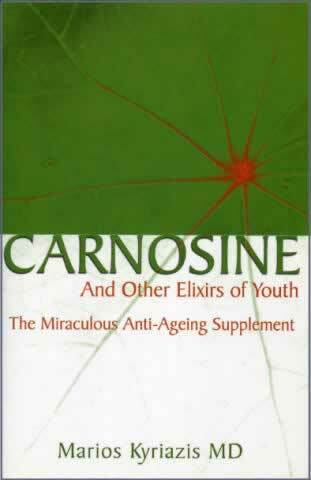 Of particular significance is the history and science underlying the important anti-aging substance, carnosine. This is an essential book for anti-aging physicians and their patients. Ward Dean MD, author of Biological Ageing Measurement. There is a growing awareness in the scientific and indeed the general community, that the ageing process is not completely irreversible; that it is possible to prevent a number of age-related diseases and to slow down and even reverse some of the damage caused by ageing. One of the most promising and powerful tools in the fight against the ageing process is the nutrient, Carnosine. There have been many claims and misconceptions about the possible and actual benefits of Carnosine but Dr. Kyriazis puts the record straight. He presents the evidence in a balanced and persuasive style, basing his arguments on sound scientific data whilst using non-technical terminology so that the information is easily accessible to a wide audience. He demonstrates that the benefits of Carnosine are greatly enhanced if it is used with a handful of other nutrients and supplements. The combination of these creates the most potent modern equivalent of the 'Elixir of Youth'.